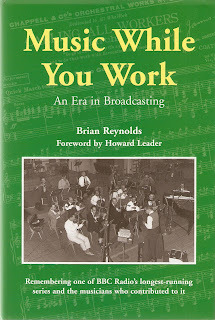 Random radio jottings: On the Light - Part 6 "Calling All Workers"
"An important effect on the working happiness of an ever-increasing number of work-people," was the bold claim made by a factory manager (1) about the impact of one particular radio programme: Music While You Work. 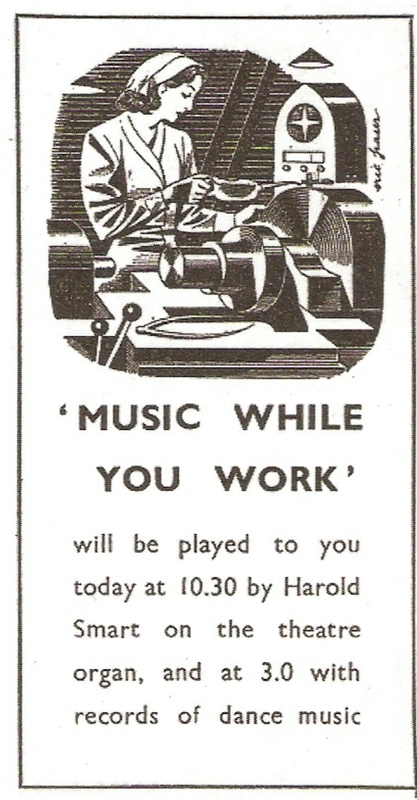 Music While You Work started during wartime but became a BBC Light Programme favourite over two decades. Seventy years after the launch of the Light (in the sixth of a series of nine posts) I take you back to the days of Eric Coates's stirring theme of Calling All Workers. The programme featured a continuous unannounced sequence of music - with "cheerful rhythms and singable melodies" - played by an orchestra, band, ensemble or organist in a 30-minute live broadcast. (2) On the first programme, airing on the morning of 23 June 1940 (3) on the Home Service, the music was provided by Dudley Beaven at the theatre organ. The second (afternoon) edition heard on the Forces Programme had the musical delights of the Organolists: Harry Farmer at the organ, Jack Moss on drums and Jimmy Leach at the piano. The thrust behind the introduction of Music While You Work was to play a part in the war production drive. The BBC's Year Book for 1941 elaborated further: "Programmes of music for factory workers have been broadcast since the end of June as a help to lessen strain, relieve monotony, and thereby increase efficiency. The initiative came from the factories, and in collaboration with recognised authorities the BBC carried out research among workers to discover their preferences, and among factories to establish their special needs. The result was the mid-morning and mid-afternoon programmes Music While You Work". Music While You Work was an undoubted success, at least in terms of listeners. By its third anniversary it reached 7000 factories and had an audience of four million workers. By the end of the war 9000 factories piped the show through their loudspeakers. The sheer volume of live music played on the programme is staggering by today's standards with two shows a day (5) each performed by a different set of musicians and broadcast five days of week. After the war it continued on the Home and General Forces Programme but from 30 July 1945 the afternoon edition went out on the Light Programme. By the early 1950s it was broadcast twice a day on the Light but with the 10.30 am show also being heard on the Home Service - this simulcasting lasting until September 1964. 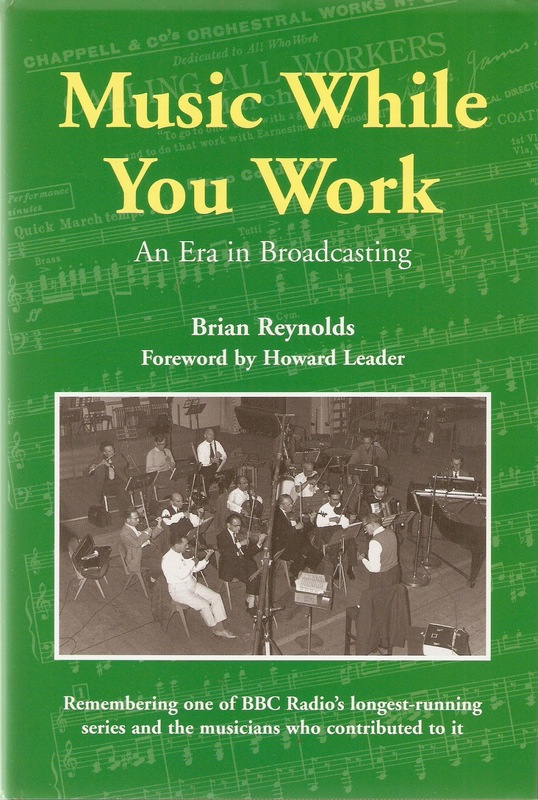 I can't possibly do Music While You Work justice so I'll direct you to Brian Reynolds's excellent Masters of Melody website and his book Music While You Work: An Era in Broadcasting. The website contains a number of shows to download, including that final edition. For a week in October 1982, as part of the BBC's 60th anniversary celebrations, the programme enjoyed a brief revival on Radio 2. Remarkably it came back as a daily show from January 1983 to January 1984 and popped up again in 1990 and 1991. This is the first of those revival shows broadcast live on 4 October 1982 and features Nat Temple and his Orchestra. Nat had first appeared on Music While You Work in 1947 and made over 30 subsequent appearances. 2 - From the summer of 1963 the shows were recorded. 3 - There had actually been a trial run of the programme, according to the BBC Genome website, in the week commencing 1 January 1940. 5 - From 2 August 1942 an additional evening edition was introduced aimed particularly at munitions workers. These lasted until the end of the war. Between 1 December 1947 and 15 September 1950 an early evening edition was also broadcast on the Light Programme. It replaced a similar orchestral music sequence programme titled Home to Music. Brian Reynolds notes that each broadcast was allotted a 3-hour rehearsal session and that the choice of music, arrangements and timing were the responsibility of the musical director. 8 - The figure must be regarded as approximate according to Brian Reynolds as the programme "was sometimes cancelled at short notice, particularly during the war". At the time that the programme was first revised in 1982 under producer Brian Willey the Radio Times reported that research showed that there were 17,329 performances and 480 different combinations.